As I began to clear the dishes from the dinner table I inexplicably started singing "Give 'em the old razzle dazzle, razzle dazzle 'em" from Chicago. Heather joined in for a few lines before continuing on with her preparations for the evening yoga class. It's been more than a week since we saw the show, but the songs and the voices still rumble about in our heads and pop out of our mouths at random moments. That's the power of a great show. 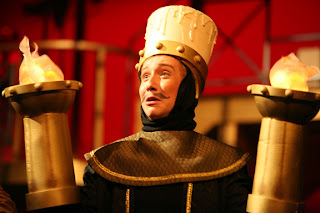 As I looked through the list of the Top 10 box office hits over the 30 years of Keyano Theatre Company producing shows, memories started coming back, ripe with meaning. At the top of the list is Beauty and the Beast from 2006. The audience it attracted was bigger than anything we had ever seen before or since. Over 5,200 people saw that show directed by Catalyst Theatre's Jonathan Christenson. 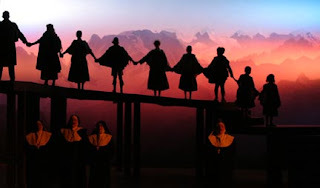 It had a terrific ensemble, band, and production values that were stunning. There were also more than a few standout performers like Georg MacDonald, Murray Cullen, Lucas Meeuse, Branden Martin, Tim Cooper, Sarah Martin, and so many more. Right near the top of the list is a show that inspired me to sing its songs long after it was over - Paul Gelineau's production of Annie. 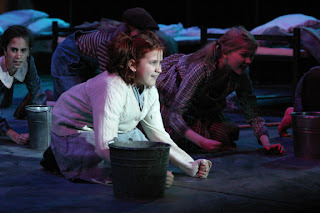 I have sharp and wonderful memories of that outstanding collection of orphans who lit the stage up night after night. They were absolutely fantastic as young teenagers, now fully grown adults and scattered across the country. The Sound of Music was another great show that is nestled in the top 5, a production that was directed by the legendary Karen Towsley. I don't use the term "legendary" loosely, as her abilities as a drama teacher, director, and producer added unparalleled richness to our community. It is a lovely memory recalling Val Gondek and Phil Kersey in the lead roles of Maria and Captain von Trapp. 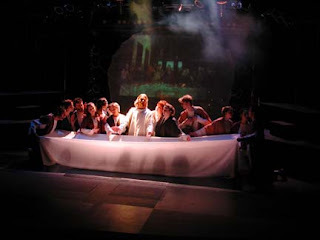 There is no question though, that the production that had the greatest impact on me was 2001's Jesus Christ Superstar. It was a game changer for Keyano Theatre, both artistically and what it did at the Box Office. Up to the point the holy grail of box office champions was Wizard of Oz. 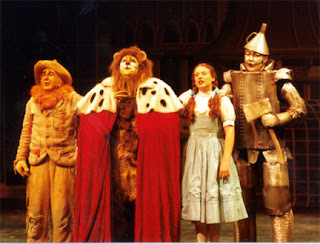 The 1992 production sat lonely at the top of the heap for a full decade before it was challenged by Jesus, Judas and company. I watched every performance of Jesus Christ Superstar; I couldn't stay away. The last supper scene remains as one of the most striking images in my Keyano Theatre memory bank. And I'll never forget the heart-shaking ending on opening night as the lights went down and the credits started to roll. The audience, emotionally wracked, not knowing what to do, sat still, a stunned tribute to the performance they had just witnessed. Chicago has emblazoned a new set of memories on the almost 3,500 patrons that basked in its glow. I think that's exciting. I think it's important. I sometimes complain that the arts often play distant second fiddle to sports and other things. The success of a show like Chicago changes that dynamic, if only for a few days. Another opportunity to put the arts in the forefront is coming up on March 10th as Keyano Theatre and Arts Centre presents its annual Curtain Raiser fundraiser sponsored by CBS Construction. It fills me with absolute dread that this is an arts fundraising event that I have never been able to attend because it falls on the same weekend as an annual conference that I go to. 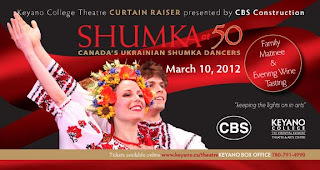 I particularly wish I was here for this year's edition because it features the fabulous Ukrainian Shumka Dancers. I enjoyed both their performances in the Theatre almost 10 years ago, more than I can possibly articulate. The artistry, athleticism of the dancers, and fantastic costumes are a spectacle for the senses. So, while I will be somewhere in San Francisco on that Saturday night, the least I can do is encourage everyone who believes in the value of arts and culture to attend, enjoy, and support all the memories created, and yet to be created, by Keyano Theatre and Arts Centre. You'll be so glad you did, and so will I.
Russell -I saw everyone of these performances and echo all your comments. Living away from Fort McMurray, sure puts it into perspective just how lucky the citizens are to have such entertainment at their finger tips. As you know, I'm down here in the panhandle in Florida and walk every morning and afternoon with my friend and her dog. Pretty much each discussion is about something in Fort McMurray and I find myself talking as if I still live there. The old Fort McMurray, before all the traffic craziness, will always be the best place I've ever lived.